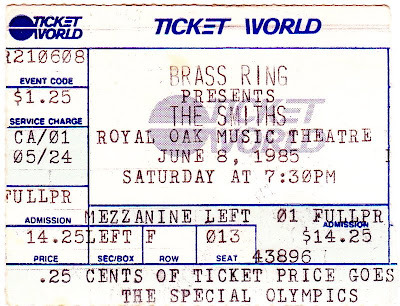 Not exactly a Flint Artifact since the show was in Royal Oak, but the ticket was purchased at Hudsons in the Genesee Valley mall and it sounds like a few readers from Flint were there to see The Smiths. Ahhh the good old days before Michael Jackson up'd the ticket ante to $30. I remember I used to walk up to the 2nd floor of Hudsons to see what tickets were on sale. One day, TH's Stop Making Sense tour had just gone on sale, and I could get 4th row tickets. I didn't have enough cash then, so I walked the mall to find someone I knew who I could borrow money from. They were the closest seats I've ever had at Pine Knob. How were the Smiths live? I always found that the studio albums often had production problems and were often over produced. The live shows sounded a lot sharper and had much more energy.